The business of healthcare is becoming more complex and the number of administrative interactions between healthcare providers and health plans is growing as a result. Despite this, the CAQH Index, an annual study of progress to simplify healthcare administrative functions, found signs that the US healthcare system has become more efficient and the cost of doing business may be declining. Since 2013, the CAQH Index has tracked adoption of electronic administrative transactions, including those mandated by the Health Insurance Portability and Accountability Act of 1996 (HIPAA) and other transactions, for conducting routine business between healthcare providers and health plans. These transactions include verifying a patient’s insurance coverage, obtaining prior authorization for care, submitting a claim, sending and receiving payments and more. The Index also began tracking progress of the dental industry beginning with its 2015 report. Automation has been available for most fee-for-service business transactions between health plans and healthcare providers for many years. However, these streamlined processes were not designed to serve the administrative needs of new payment and care models that are transforming healthcare today. As a result, providers and plans are interacting more frequently—multiple times and often through multiple channels—to clarify information to support a patient’s access to care, facilitate payments, and more. Even as these trends emerged, the CAQH Index found marked improvements in several measures of administrative efficiency and cost. Savings Opportunity Declined. The 2018 CAQH Index, which studied 2 billion administrative transactions between health plans and providers, found that the US healthcare industry reduced the remaining annual savings opportunity for the first time in Index history. By completing the transition to electronic transactions, medical health plans and providers could save $9.8 billion annually, a 12% drop from that reported in the 2017 Index report (Figure 1). Conversely, the Index found a $600 million year-over-year increase in dental industry savings opportunity, bringing it to $2.6 billion. As in prior years, providers would most benefit from the transition from manual to electronic transactions. Of the $9.8 billion medical industry savings opportunity, $8.5 billion (87%) belongs to providers and $1.3 billion belongs to plans (Figure 2). Adoption of Electronic Transactions Improved. The Index found improvements in adoption of most of the seven electronic administrative transactions tracked. The greatest increase in electronic adoption occurred for eligibility and benefit verification (+6 points) and coordination of benefits/crossover claim (+5 points). Adoption of the electronic transaction declined for only 1 transaction: remittance advice (-8 points) (Figure 3). Manual Volume Fell. The savings generated by increased adoption of electronic transactions outweighed the cost of more frequent administrative interactions between plans and providers. In prior years, administrative transaction volume increases have driven savings opportunity higher as adoption of electronic transactions rose. 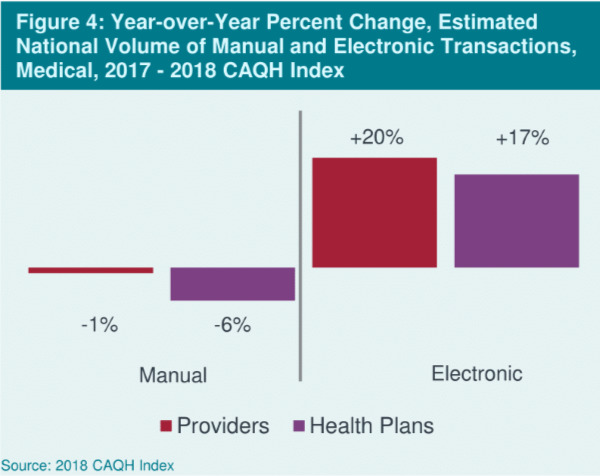 Even as plans and providers interacted more frequently, driving up the number of administrative transactions (by 18% overall), the volume of more costly, time-consuming manual transactions declined by 6% year-over-year for health plans and by 1% for providers (Figure 4). In addition to observing that benefit and payment complexity is affecting the use of administrative transactions, the 2018 CAQH Index found that industry standards and operating rules have not kept pace with market innovation and transformation. For instance, the number of eligibility and benefit verification transactions increased by 32%. Though the volume of electronic transactions increased, it is important to note that there was not a corresponding decline in the use of more costly and time-consuming manual phone transactions. These results suggest that, for a portion of patient encounters, a phone call is needed to fully understand patient eligibility, coverage or benefits. Meanwhile, more than half (51%) of prior authorization transactions were conducted manually, and more than 1 in 3 (36%) were processed using a health plan portal or other non-HIPAA standard system. These results suggest that the current prior authorization standard transaction, which does not address electronic exchange of clinical attachments, is inadequate to support current market needs. Finally, although electronic claim status inquiries have historically been used by providers and their vendors as a revenue cycle tool, the volume of claim status transactions declined in the 2018 Index report. The Index asserts that claim status inquiries may be less relevant as an increasing number of patient encounters are compensated under value-based payment arrangements. Although the 2018 CAQH Index found that healthcare industry administrative transaction costs have begun to decline, even as overall transaction volume increased, it also concluded that challenges remain. First, greater adoption of electronic administrative transactions is needed. While 3 of the 7 transactions studied now have adoption levels at or above 80%, adoption of other electronic transactions lags. (Figure 3) For example, adoption of electronic prior authorization transactions stands at only 12%. Second, the CAQH Index identified a need for standards, operating rules, infrastructure, and systems functionality to better accommodate growing transaction volume and to more closely align with evolving market needs, such as the transition to value-based payment. Increasingly complex benefit plans and payment arrangements often require data sharing that was not anticipated by existing standards and operating rules. Administration of benefits and payments for these arrangements more frequently lead to manual transaction processing or use of partially electronic online portals to transact information. (Visit CAQH’s website for more information on opportunities associated with value-based payments.) In addition, the Index identified opportunities for vendor systems to facilitate provider adoption of electronic transactions through more timely and comprehensive deployment of new and updated standards and operating rules. Findings from the 2018 CAQH Index suggest that positive change is occurring in the industry overall. Healthcare industry stakeholders have made progress on many fronts—reductions in the savings opportunity, improvements in adoption, and reductions in the volume of manual transactions. However, continued efforts are needed to ensure that all stakeholders realize the full benefit of conducting business electronically and that industry administrative systems adapt to the changing needs of the healthcare system. The 2018 CAQH Index is available for complimentary download. For more information about the Index or participating in the Index contact explorations@caqh.org.